On September 12, CPD joined members of the Alliance to Reclaim Our Schools (AROS), an alliance of parent, youth, community and labor organizations that together represent over seven million people nationwide, to release a report detailing billions of dollars in federal funds owed to Black, brown and low-income students. 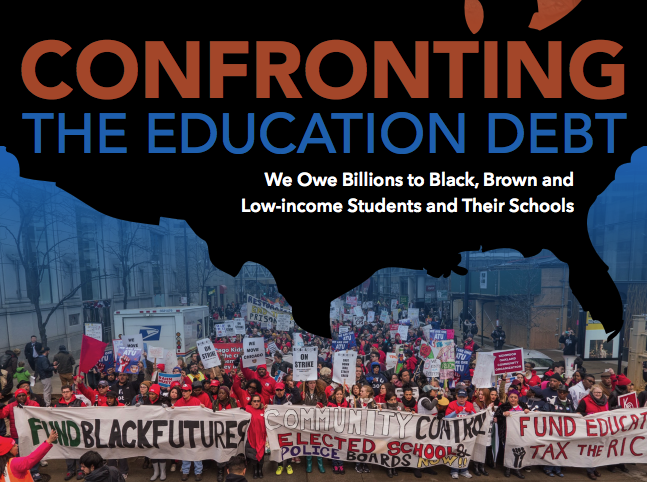 Confronting the Education Debt demonstrates that, between 2005 and 2017, schools in Black and Brown communities were underfunded by $580 billion in Title I and IDEA funding. Over that same period of time, the personal net worth of the nation’s 400 wealthiest individuals grew by $1.57 trillion. The report details the systematic stripping of resources from public schools serving Black, Brown and low-income children due entirely to policy priorities and political decisions. The gaps created by this severe lack of federal funding are then passed on to the state and local level -- the consequences of which are felt directly by our most marginalized students. As CPD President and Co-Executive Director, Jennifer Epps Addison, notes: “...Confronting the Education Debt, is a devastating account of our country's failure to support our most vulnerable children and youth -- to the tune of $580 billion dollars. The right to a quality public education is a cornerstone of a thriving democracy. For generations Black and Brown communities have fought to expand education freedom and equity. To deny students fully and equitably funded public schools is to deny them their freedom to thrive. This debt is even worse when considered against the huge sums of money spent on simultaneously criminalizing those same students at their schools and ultimately funding the school-to-prison pipeline. Confronting this debt is the minimal first step towards ensuring that all our youth, and youth of color in particular, are provided the opportunities to grow and the freedom to thrive." The report was released as part of a national campaign being launched by AROS, and driven by local groups including CPD affiliates, to build grassroots campaigns for racial justice, for the expansion of Community Schools, and for the progressive renue needed to fund them. Read and share the full report here.